Our Mutual Friend was Charles Dickens’ last complete novel. It was written in 1864-1865 when he was at the height of his fame having recently published A Tale of Two Cities and Great Expectations. The main theme of the novel is money and the effect that it can have on personal values and relationships. 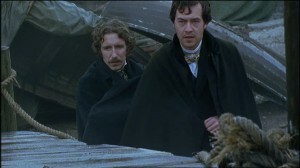 At it’s very core is the love triangle between repressed schoolteacher Bradley Headstone (David Morrissey – Thorne: Sleepyhead), his rival Eugene Wrayburn (Paul McGann – New Tricks)and their shared love interest Lizzie Hexam (Keeley Hawes – Upstairs Downstairs). When John Harmon, a young man whose inheritance is dependent on his marrying a woman he has never met, is found dead in the Thames, his fortune is passed onto the Boffin family who take both Harmon’s would-be bride Bella Wilfer (Anna Friel – Pushing Daisies) and mysterious secretary Rokesmith (Steven Mackintosh – Camelot) into their home. Meanwhile, Lizzie Hexam’s father is accused of Harmon’s murder and she is relentlessly pursued by her two suitors. Filmed at The Historic Dockyard Chatham, the location was used for the bleak side streets surrounding the workhouse. Charles Dickens’ father worked as a Naval Pay Officer at the Dockyard and it was here that Dickens developed a love of the sea, accompanying his father as a young boy. Later, these childhood adventures were a source of inspiration for novels such as Great Expectations and Our Mutual Friend. The Kingswear Castle Paddlesteamer that is based at The Historic Dockyard Chatham was also used for filming the scene where Bella Wilfer and the Boffin family go for a day out. The Historic Dockyard Chatham dates back to the 17th century and contains over 100 buildings from the Georgian and Victorian periods. The Historic Dockyard Chatham is a popular film location that has previously featured on screen in Suffragette (2015), Downton Abbey (2013) and Les Miserables (2013). Dickens has a rich history with Kent and the Kent Film Office celebrates Dickens history with the county including TV and film adaptions in The Dickens Trail which launched in 2012. Our Mutual Friend aired on the BBC in March 1998 and is now available on DVD. This entry was posted in Filmed in Kent and tagged Charles Dickens, Our Mutual Friend film locations, River Medway, The Historic Dockyard Chatham, TV Drama. Bookmark the permalink.